Platelet Rich Fibrin (PRF) is a by-product of blood (plasma). 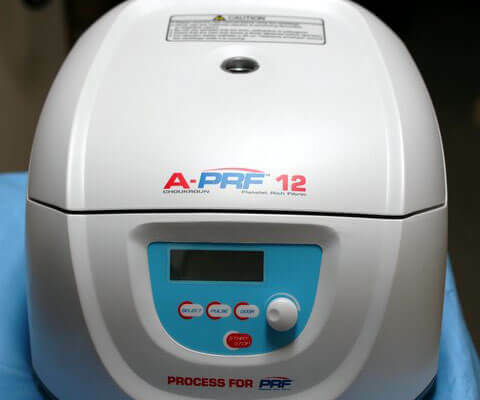 Rich in platelets, PRF allows the body to heal at greatly accelerated rates. When the body begins the natural healing process, many types of cells are sent to the injured area to promote healing. Platelet cells are an important part of the healing process, helping to form blood clots and to release growth factors into the wound. These growth factors help the body repair itself by stimulating stem cells which regenerate new tissue. Created in France by Dr. Joseph Choudroun, this groundbreaking technology uses only a small amount of the patient’s own blood. Once the PRF has been prepared, the doctor can significantly increase the number of platelets in the injured area, which increases the growth factors released, which then speeds healing and helps to make the healing process more efficient. PRF can be created in our Marblehead, MA office, which serves Boston as well, while the patient is having an outpatient surgical procedure, such as dental implants. Because PRF is created using a patient’s own blood, there is no concern about disease transmission and no chance of rejection. Since PRF only needs a small amount of blood, the cost incurred by the patient is significantly lower than typical hospital or blood bank harvesting fees. By providing extra platelets, PRF supplies the wound with extra growth factors that help to speed up the healing process. The stem cells, white blood cells and other substances in your blood promote healing and the regeneration of your own new bone and gum tissues.